In last year’s newsletter we told you about CFC. Mike was disappointed not to see the boys training and catching up with one of the boys, Gedefaw, Mike asked if the team was still together. Gedefaw explained that despite some leavers and joiners they are still together and although they do train once a week mainly doing running and stretching as they did not have a ball. This was quickly rectified with two balls that we took out and the boys were soon in full training. The life expectancy of a leather football is about a month due to the condition of the ground. The boys still have last year’s kit all 16, and are playing a match about every 3-4 weeks. 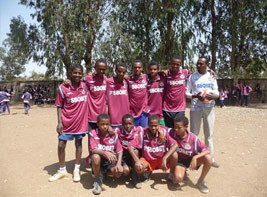 They explained that they needed another kit as the current kit had clashed sometimes with the opposition. Mike agreed to buy another kit and left the boys to purchase it from the market. The came back with the German away kit, and disgruntled looks from Mike. They did not understand the football rivalry. In order to keep the team functioning they require an injection of cash mainly for food after the games and balls. We decided to open a bank account for them with £100 and look for a sponsor on our return. £250 per year is ample to keep the club going and 16 boys to play football.